Yellow Jackets, Wasps, Hornet and other stinging insects are a common problem in the Pacific Northwest, especially in the warmer months. They usually have lance-like stingers with small barbs which are capable of stinging multiple times. 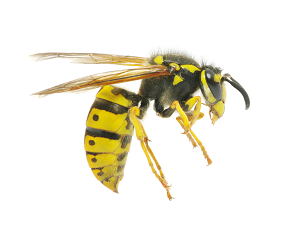 We treat wasp and stinging insect infestations by spraying and removing the nest if possible. Our methods are safe and effective. Getting rid of hornets, yellow jackets and wasps safely and effectively requires trained experts. Most stinging insects will be eliminated when the nest is sprayed, however, if the nest cannot be removed, a follow-up visit may be necessary. With regular pest service, you are covered if any Yellow Jackets, Wasps, Hornets or other stinging insects try to build a new nest on or near your home. If these steps are followed, we guarantee your home will be free from wasps, yellow jackets and hornets. If they try to come back on our watch, we’ll get rid of them!